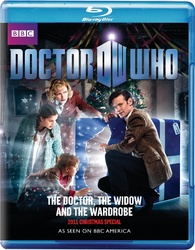 The 2011 Christmas special of the sci-fi series will be traveling to Blu-ray in February. In an early announcement to retailers, BBC/Warner will be releasing 'Doctor Who: The Doctor, the Widow, and the Wardrobe on the high-definition format on February 14. Specs have yet to be revealed, but supplements will include: Doctor Who Confidential – An inside look at the 2010 Doctor Who Christmas Special; Doctor Who at the Proms – Concert performance of music from Doctor Who recorded live at the Royal Albert Hall during the BBC’s annual Proms concerts. Suggested list price for the Blu-ray is $19.89. You can find the latest specs for 'Doctor Who: The Doctor, the Widow, and the Wardrobe' linked from our Blu-ray Release Schedule, where it's indexed under February 14.